Cuba for several decades has experienced limited access to international financial markets. This followed defaults and arrears on foreign loans, bonds and other financial obligations, the withdrawal from international financial agencies, the closed access to the US economy and a fragile balance of payments situation. Financial markets are said to have long memories and without actions to remedy the defaults lenders showed scarce appetite to face Cuban risk even for short-term import or export finance. In recent years Cuba has made an effort to improve its external financial profile and lower its debt service burden by negotiations with official lenders in advanced economies including Russia and with major developing countries such as China and Mexico. The centerpiece of these efforts are the debt restructurings implemented with Russia in 2014 and in 2016 with 14 country lenders under the aegis of the Paris Club. The figures in the Table illustrate the magnitude of the two major debt restructuring agreements reached by Cuba since 2014. The agreement with Russia implemented in 2014 led to a reduction of the debt to the Paris Club from $35.2 in 2013 down to $7.3 billion at year end 2014. In effect Russia agreed to forgive over $25 billion of Soviet-era debt. This old debt was not recognized by Cuba and was excluded from the official data released by Cuba’s central bank. The agreement with Russia was negotiated bilaterally between the two countries and reported by the Paris Club of which the Russian Federation is a member. Negotiations with 14 countries in the framework of the Paris Club first involved full recognition of the outstanding debt by the government of Cuba. This is shown in the Table by the increase of $3.3 billion in the debt to the Paris Club during 2015. It involved recognition by Cuba of interest arrears and penalty charges incurred during the default of official debt going back to 1986. During 2016 some $4.8 billion of this debt was restructured by members of the Paris Club, including $2.6 billion cleared of debt in arrears. As much as $800 million of this debt will be converted into local currency funds to be disbursed in projects as part of bilateral agreements. Debt to the Paris Club was reduced by 81% between December 2010 and December 2017. At the same time Cuba is now resuming debt service payments on the reduced debt including both interest and principal. These payments are back-loaded, reportedly reaching only about $100 million in 2016 and 2017. Excluding Soviet-era obligations the debt reduction to the Paris Club was 43%. Will this major forgiveness of Cuban debt lead to wider access to international finance? The answer hinges principally on the perceived ability of Cuba to service its foreign debt obligations in coming years given external liquidity and a weak balance of payments. 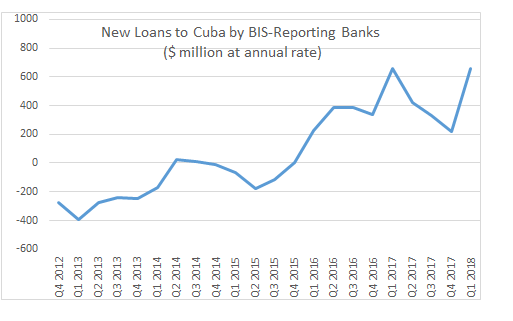 For the time being we can examine the immediate results of Cuba’s restructuring agreements as shown by international bank loans reported by the Bank for International Settlements (BIS). Source: Bank for International Settlements, Locational Statistics, Counterparties Resident in Cuba. The Chart shows changes in loan balances to Cuban banks and other entities for the period starting in the fourth-quarter of 2012 to the first quarter of 2018. There are net repayments until the last quarter of 2015 when agreement was reached with the 14 members of the Paris Club. Thereafter lending turned positive though at modest levels. In the one year to end 2016 new lending was $340 million and $219 million in 2017. The new lending reported in 2016 is distorted by the incorporation of international banks from China and Russia in the BIS statistics as of the fourth quarter of 2015. This means that much of the reported $340 million increase in 2016 consisted of old credits from Chinese and Russian banks now included in the data. Hence new loans from international banks in 2016 are unknown. The end of 2017 data is more relevant as it starts with the new base of lending that includes China and Russia, and it reached $219 million as mentioned above. New lending fluctuates and in the first quarter of 2018 it was higher by $661 million as against the first quarter 2017 level. At this high point at the end of March 2018 total bank loans reached $2.6 billion. This would cover 21% of total Cuban imports by 12-month loans if all lending is trade-related. In practice many loans support working capital needs of foreign and Cuban firms in the island and do not finance imports of goods and services. It is not possible to identify all sources of new lending as less than half of the 47 BIS-reporting countries provide relevant statistics. As expected it is a mixed situation. Spanish and Swiss banks increased exposure while French banks lowered loans outstanding. The data implies that Chinese bank lending is rather small given the size of exports from China to Cuba. However there is official Chinese lending from export credit agencies not recorded in BIS data. Summing up, international banking data show movement from a period of net reduction in lending to one of positive flows. Even as new lending is modest and comprised of short-term loans, it nonetheless denotes warmer creditor sentiment since the 2015 agreement with the Paris Club. This also reflects Cuban actions to remain current on debt-service obligations to banks and countries participating in Paris Club negotiations. There is apparently a seasonal pattern in reported lending which makes it useful to compare same quarter data. The 14 members of the Paris Club involved in the Cuba agreement are Australia, Austria, Belgium, Canada, Denmark, Finland, France, Italy, Japan, The Netherlands, Spain, Sweden, Switzerland and The United Kingdom. 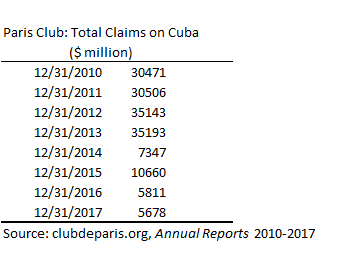 “Agreement on the Debt Between Cuba and the Group of Creditors of Cuba”, December 12, 2015, clubdeparis.org. Marc Frank, “Cash-strapped Cuba makes debt payment to major creditors: diplomats.” Reuters, October 18, 2017. The BIS data includes lending by international banks residing in 47 countries and offshore financial centers.